-- Statement signed by the Archbishop of Cincinnati, the Bishop of Columbus, and 8 other Roman Catholic Church leaders in Ohio, reported to have "joined a chorus" of calls for repeal of the state's 30-year-old capital punishment statute. 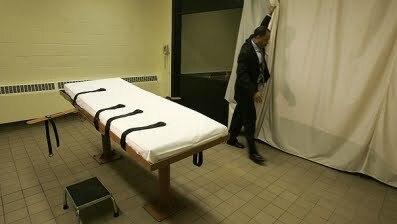 (credit for 2005 AP photo of Ohio's execution chamber) Others sounding this call include "Ohio Supreme Court Justice Paul E. Pfeifer, a Republican who helped write the state's original death-penalty law" (his anti-death-penalty op-ed is here), as well as "a former state prisons director who witnessed 33 executions." Data revealed Ohio to be 2d only to Texas in the number of recent executions; another is set for February 17. Ohio's death row houses 156 men and 1 woman.